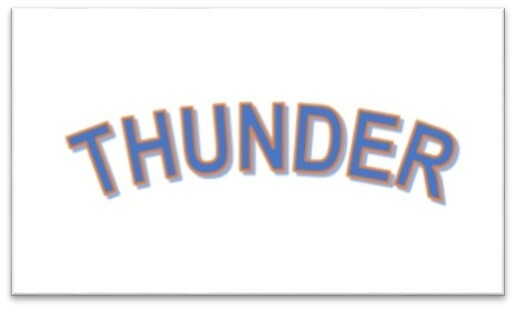 I admit with some embarrassment that I am a total, absolute, over-the-top OKC Thunder fan. My family and friends are pretty incredulous about this—I’ve never shown any interest in sports that weren’t related to my children. Ever. Nevertheless, my move to Oklahoma City closely correlated with the arrival of the new Oklahoma City Thunder (transferred and renamed from Seattle). The team was young and was definitely an underdog in those days and I quickly became a fan. They were so energized and persistent. Some of their members were enthusiastic (at least to our face) about being in Oklahoma City and I embraced them along with the rest of the fans in Oklahoma City. I don’t know how different the Oklahoma City Thunder is from other teams, since I never was interested enough about other basketball teams to pay attention. It is likely, therefore, that the lessons I lay out here are true for other sports teams. I just don’t see and hear the same things about them. Successful teams have several leaders and have people who aren’t traditionally leaders step up into those roles when needed. Sure Scott Brooks is a great coach/leader, and Kevin Durant is a leader. But so are Russell Westbrook and Derrick Fisher (the old guy) and Serge Ibaka and Thabo Sefolosha. When the situation calls for it, someone steps up. They aren’t lost without ‘the’ leader. They REALLY work. They take their work seriously. They practice, practice, practice, practice. Malcolm Gladwell says in Outliers that REALLY good people practice more than the rest of us (in fact he says the number is 10,000 hours—which has been disputed by some). We know this in our heads. Most of us don’t want to be great enough to put the work in. The Thunder is an example of what happens when you do. (At the moment they have the best record in the West and the second best in the East). They have risen to Playoff level very quickly for such a young team. They wouldn’t be there without the hard work. How many of us approach our work that way? Or how many of us put in “enough” hours and go home? How many of us are considered the ‘best’ at what we do? Kevin Durant, the leading scorer on the team, ALWAYS talks about team. Coach Scott Brooks ALWAYS talks about team. Teams support each other. Teams work together. Teams use each member’s strengths to achieve the team goals. Do you even talk the “team” talk? That’s a place to start, especially if you are the leader. Do you walk the “team” walk? That’s what it takes for people to believe it. Teams get better results. Do you believe that? Do you see it? Thunder makes it obvious. As Kevin gets better and better (currently he is the leading scorer in the NBA by quite a margin), and as the Thunder’s record grows, the pressure is mounting to continue the performance. Can they? Will they? These are the questions that get asked of Brooks and Durant and the other players. Their answer is always the same. We focus on the next game. We are thinking about today’s game. They refuse to engage in the discussion of anything but the very next obstacle ahead of them. Do you do that? Or are you thinking about the next three things? Or are you consumed by the 3,000 things that must get done before the project is done? Yes, you have to be aware of the things ahead. Your focus, however, should be on the NEXT thing. FOCUS on what is next. Get it done. Then do it again. It seems to work for the Thunder. Related to taking it one day at a time, when things go wrong—lose a game, lose a player—start again with the next practice, game, emergency. Get it out of your head. Get on with what is next. This is an extremely helpful (and hard to do) tactic. If you let the loss go, and FOCUS on what is next, you are starting fresh. You have a much better chance of changing the future with this tactic. It is not unusual for the Thunder to be behind by twenty points. How, you might ask, can they be a great team if they are behind by that much? They just don’t freak out. They just keep plugging away. They keep trying. They keep playing. And usually, they catch up and get ahead. They don’t freak out when they are behind. They don’t rest and relax when they are ahead. They keep playing HARD.